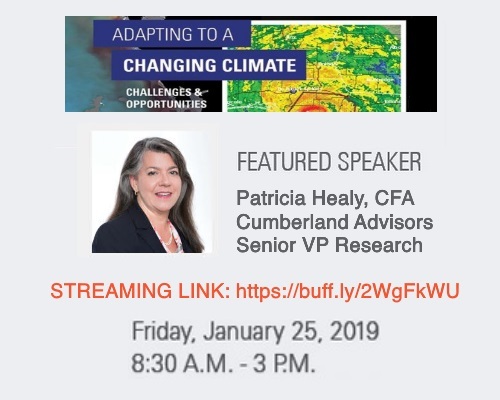 Cumberland Advisors’ Patty Healy is participating in the Climate Change Summit held at USF Sarasota-Manatee today, January 25, 2019. She’ll be speaking to the audience about municipal bond ratings relating to how prepared these entities are for severe weather events, the impacts of climate change, and other factors that may affect credit ratings. I’ll be helping out with introductions, interviews, and as an emcee. Bob Bunting, an accomplished entrepreneur and scientist, will lead the conference through many important topics and panel discussions. On December 30, as 2018 drew to an end, NBC’s Meet the Press aired an entire program on the climate change crisis, well worth watching (https://www.nbc.com/meet-the-press/video/meet-the-press-1230/3850857). Host Chuck Todd gave no air time to climate change denialism. Instead, the episode plunged into analyzing the crisis at hand, what might be done, what impediments slow our time-critical response, and how to overcome those impediments. Florida Republican Representative Carlos Curbelo, among other program guests, called for constructive action. “We need to stop covering the debate and start covering the story, so that people see that this is real, and so that politicians take a more-pragmatic approach and find solutions that are actually achievable,” Curbelo said. The day after Thanksgiving, despite Mr. Trump’s personal dismissal of climate change, the Trump administration released Volume II of the Fourth National Climate Assessment (https://www.globalchange.gov/nca4), and we’ve been digesting its deeply concerning contents in the week since. The impacts of climate change are myriad, affecting our world, our communities, our health, our food supply, and our investments. We will be taking a look at a number of climate-change-related issues impacting Florida and beyond, from sea level rise to red tide to hurricanes to fruitful adaptive strategies and the economic opportunities they present, when we convene on Friday, January 25, at the University of South Florida Sarasota-Manatee for our one-day event, “Adapting to a Changing Climate: Challenges & Opportunities.” See the full roster of speakers, including our own Patricia Healy, here: http://sar.usfsm.edu/event/adapting-to-a-changing-climate/. We hope to see you there. In today’s commentary, however, I would like to zero in on the impact of climate change on vector-borne diseases, including Zika. Chapter 14 of the Fourth National Climate Assessment (https://www.globalchange.gov/nca4) addresses the adverse effects of climate change on human health, noting that “Climate change affects human health by altering exposures to heat waves, floods, droughts, and other extreme events; vector-, food- and waterborne infectious diseases; changes in the quality and safety of air, food, and water; and stresses to mental health and well-being” (p. 545 in the full report PDF). We have no trouble grasping the threats posed by heat waves, fires, floods, and storms that claim lives as well as property, along with droughts that parch crops and threaten water supplies, but we should not miss the implications of climate change for increased vector-borne disease risks. As the report points out, “Climate change is expected to alter the geographic range, seasonal distribution, and abundance of disease vectors, exposing more people in North America to ticks that carry Lyme disease or other bacterial and viral agents, and to mosquitoes that transmit West Nile, chikungunya, dengue, and Zika viruses” (p. 545). The range of the Aedes aegypti mosquito, for example, a primary vector for dengue, chikungunya, Zika, and yellow fever, is expected to expand considerably worldwide, exposing far larger populations, particularly in Australia, Europe, and North America, to those viruses. According to one recent study, well before the end of the 21st century, 68%–80% of human populations may share their environments with Aedes aegypti and thus be vulnerable to the diseases that mosquito can carry, with the percentages depending on the climate change scenario that actually unfolds, (https://link.springer.com/article/10.1007%2Fs10584-016-1679-0). In general, lower greenhouse gas emissions translate to less risk for human health. Climate Central analyzed weather data for 244 US cities to determine the number of disease danger days each city faces now as the climate warms. They found that 94%, or 229, of the cities they studied are already seeing an increase in the number of days when average temperatures fall within the optimal range for mosquito-borne disease transmission. Some areas, however, may become too hot for the mosquitoes themselves. Phoenix, for example, actually has fewer disease transmission danger days than it did previously because of the number of extremely hot days the city must contend with. All in all, only 12 cities are experiencing a decrease in disease danger days. As the climate warms, the report concludes, Americans face heightened risks for dengue, Zika, chikungunya, and West Nile (http://www.climatecentral.org/news/us-faces-a-rise-in-mosquito-disease-danger-days-21903). The 2015–2016 Zika outbreak drove home the hazards of mosquito-borne diseases, as Zika took a terrible toll on the development of one in seven unborn children whose mothers were exposed to the otherwise generally mild virus (https://www.contagionlive.com/publications/contagion/2018/october/zika-where-are-we-now). Babies were born with microcephaly and/or other birth defects such as vision problems, deafness, and epilepsy. Their lives and their family’s lives were forever changed from what might have been. In 2018, Zika has not made many headlines in the US, and the case count is down. As of December 4, 2018, the provisional case count for US States is 58 for the year, all travelers returning from affected areas. US territories have reported 116 Zika cases, with the virus presumably transmitted through local populations of infected mosquitoes (https://www.cdc.gov/zika/reporting/2018-case-counts.html). Case counts aside, the virus remains a threat – nothing has changed about its intrinsic potential to wreak havoc. It is still active throughout the South and Southeast Asia region, and some districts in India saw worrisome outbreaks in 2018 (https://www.hindustantimes.com/health/healthwise-new-outbreaks-need-better-disease-surveillance/story-2bSekn9rGCIbWADtk9p2TK.html). While some experts hypothesize that “herd immunity” has been achieved in areas hardest hit in 2016, Carmen Zorilla, professor of obstetrics and gynecology at the University of Puerto Rico School of Medicine in San Juan, disagrees. She estimates that about 10.5% of pregnant women in Puerto Rico tested positive for Zika during the outbreak – an infection rate not nearly high enough to confer herd immunity. She observes that such viral outbreaks tend to happen in 3–5-year cycles. (https://www.contagionlive.com/publications/contagion/2018/october/zika-where-are-we-now). Problematically, some 60–80% of Zika cases are asymptomatic, so Zika can readily go undetected and gain a foothold before it is identified in a particular area. Fewer than half of those infected actually seek medical care (https://www.contagionlive.com/publications/contagion/2018/october/zika-where-are-we-now). Most of the time, symptoms, when people do have them, are relatively mild and somewhat flu-like: fever, rash, headache, achy joints and muscles, and conjunctivitis, though in rare instances a Zika infection can lead to Guillain-Barré syndrome. Currently, the CDC recommends Zika testing for pregnant women with possible Zika exposure and for those who experience Zika symptoms after traveling to areas where they might have been exposed to the virus (https://www.cdc.gov/zika/hc-providers/testing-guidance.html). Is there room in that surveillance net for a Zika outbreak to fire up before it is detected? Definitely so. In 2016, a research team led by Northeastern University professor Alessandro Vespignani and overseen by the Center for Inference and Dynamics of Infectious Diseases, projected the discrepancy between the number of reported Zika cases and the likely number of actual cases. The team’s models projected that the actual number of infections in July 2016 was likely 25 times the number of confirmed cases (https://www.sciencedaily.com/releases/2016/08/160802133703.htm). Dr. Vespignani notes that major outbreaks are associated not only with the right air temperature but also with areas of standing water. In many instances, people educated to understand the risks can manage those, emptying the birdbath or flower pot saucers and the like at least once a week; but after major precipitation events magnified by climate change, when there is standing water everywhere, mosquito populations can spike. The sopping US Southeast, where rainfall records were handily broken in 2018, can testify that there is sometimes “water, water everywhere,” to borrow a phrase from Samuel Taylor Coleridge (https://www.accuweather.com/en/weather-news/2018-leaves-its-mark-in-the-rainfall-record-books-across-eastern-southern-us/70007024). Kate Fowlie, spokesperson for the US CDC, warns, “Mosquito-borne disease outbreaks are difficult to predict. There will be future outbreaks, including large ones, as well as years with reduced transmission, but it is impossible to know when or where these transmission patterns will occur” (https://www.contagionlive.com/publications/contagion/2018/october/zika-where-are-we-now). It seems obvious that surveillance is key to preventing outbreaks both in the present and in a warming future, but the CDC’s funding for expanded infectious disease surveillance is due to run out in 2019. The CDC is already planning to scale back its participation in the Global Health Security Agenda (GHSA), an early-warning system for infectious disease outbreaks, in 39 of 49 countries (http://www.ghtcoalition.org/blog/global-health-and-medical-research-saved-from-the-chopping-block-in-2018-spending-bill). 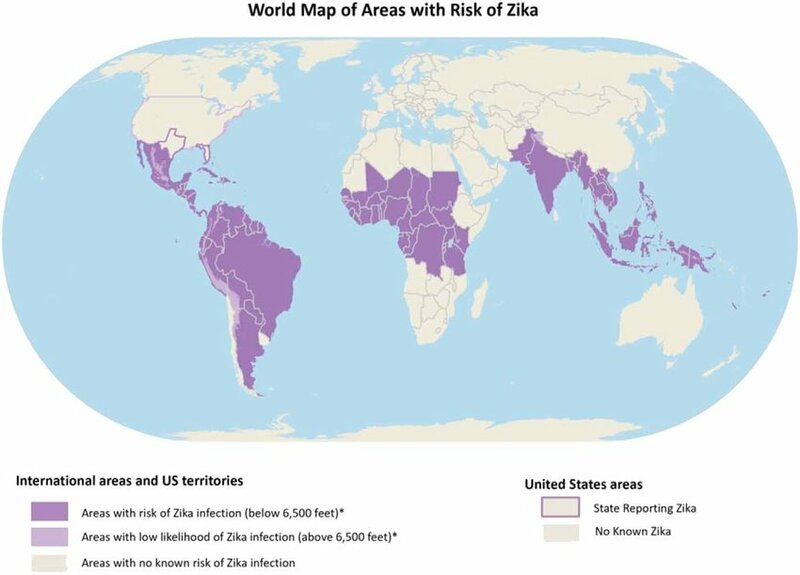 While the US will be assisting with infectious disease surveillance in 10 countries, the map of Zika-affected areas around the globe, courtesy of the CDC, is expansive (https://wwwnc.cdc.gov/travel/files/zika-areas-of-risk.pdf). There is a lot of purple on this map, but these are not all the places Zika can go; they are merely places where infection is already a risk. Infected travelers can fly all over the world, and disease-bearing mosquitoes know no borders other than inhospitable habitats. Climate change, as we have seen, will widen the range of vector-borne diseases, sharply increasing the percentage of the global population at risk. Viruses themselves, of course, are moving targets, as they mutate regularly – Zika posed no known risk to the unborn until this century, when a mutation changed what had been a mild pathogen (https://www.washingtonpost.com/news/speaking-of-science/wp/2017/09/28/zika-was-a-mild-bug-a-new-discovery-shows-how-it-turned-monstrous/?utm_term=.af60fd526a41). Scientists also warn us that we may soon be contending with disease-causing bacteria and viruses that have lain dormant for centuries or even millennia, frozen in permafrost that is now melting as the Arctic warms (www.bbc.com/earth/story/20170504-there-are-diseases-hidden-in-ice-and-they-are-waking-up). As we look ahead, addressing climate change will clearly entail grappling with expanded threats to human health, and one of those threats will be elevated vector-borne disease risks, perhaps coupled with diseases modern medicine has yet to encounter. Climate change mitigation and adaptation, combined with vigilant surveillance, vaccine development, and mosquito population control strategies will all be keys to managing vector-borne disease risks posed by certain species of mosquitoes and ticks. This commentary has been a deepish dive into just one of the secondary challenges climate change will pose to nations, states, cities, municipalities, and the well-being of Americans. In the instance of Zika, we know that the lifetime cost of caring for one child whose life is profoundly impacted by prenatal exposure to the Zika virus, beyond heartbreak, is likely to reach one to ten million dollars (https://wwwnc.cdc.gov/eid/article/23/1/16-1322_article). Human health is just one area in which proactively addressing climate change and adaptation makes both imminent sense and dollars and cents. Again, if you are in the Sarasota area on January 25, we hope you will join us at the University of South Florida Sarasota-Manatee for “Adapting to a Changing Climate: Challenges & Opportunities.” Find more information about this one-day event and register here: http://sar.usfsm.edu/event/adapting-to-a-changing-climate/. Gary Shilling is an icon of our finance industry. His monthly missive is priceless. Fred Rossi edits and researches. The work product is extraordinary. We thank them for permission to share the December monthly in full. The trigger for our request was their thorough examination of the climate-change debate and the coincident timing, as registration is now open for the January 25th GIC-USFSM conference, Adapting to a Changing Climate: Challenges & Opportunities, to be held at the University of South Florida Sarasota-Manatee. The conference is fully sponsored, so the registration cost is only 50 bucks to cover lunch and direct costs. Issues such as red tide, hurricane intensity, and rising sea levels are among those to be examined. The purpose of the conference is not to find fault; instead, it is to discuss what to do now and tomorrow and next week and next month. Please take a look at the excellent data assembled by Gary and Fred, starting on page 31 of Gary Shilling’s Insight for December, available here as a PDF file: https://cumber.com/pdf/A.-Gary-Shilling’s-INSIGHT-December-2018-(Climate-Change-A-Look-From-Both-Sides).pdf – page=31. Also look at the latest official US report on climate change, released by the Trump administration on the day after Thanksgiving: Fourth National Climate Assessment, Volume II: Impacts, Risks, and Adaptation in the United States, https://nca2018.globalchange.gov/. Another valuable source of reliable analysis of climate change comes from the Becker Friedman Institute for Economics of the University of Chicago. Their working paper 2018-51 is entitled “Valuing the Global Mortality Consequences of Climate Change Accounting for Adaptation Costs and Benefits” (August 2018). It’s available here: https://bfi.uchicago.edu/Greenstone-WP-201851. We hope that you will join us at the USFSM auditorium on January 25 for the conference. Please forward this message to anyone who might be interested in this subject. Cumberland Advisors, the Global Interdependence Center, the University of South Florida Sarasota-Manatee, the Science and Environment Council and Atlas Insurance are the primary sponsors in this event that will feature Bob Bunting among other luminaries invited for this very important discussion. In this post you’ll find a compilation of resources that can be referenced as part of the ongoing conversation on climate change and its impact. Sarasota Magazine – Climate Change Conference Set for Jan. 25. 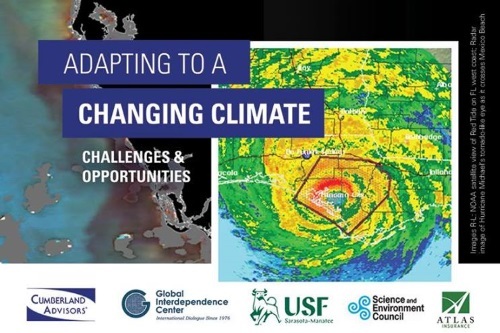 The January 25th GIC-USFSM conference on adaptive climate change, Adapting to a Changing Climate: Challenges & Opportunities, to be held at the University of South Florida Sarasota-Manatee, includes discussion of fires as well as hurricanes. Here is a recent Bloomberg story for reference: “What Wildfires and Hurricanes Mean for the Global Economy” (https://www.bloomberg.com/news/articles/2018-11-22/what-wildfires-and-hurricanes-mean-for-the-global-economy). 2018 has been a horrible and murderous year for fires. We all know that. The issue for climate change deniers and for climate change believers is whether we can expect normalcy or whether something is different now, requiring adaptive solutions. January 25 will focus on that question. Cumberland Advisors is proud to sponsor this conversation, which presents skilled professionals in a transparent and independent forum. Attendance costs only $50 to cover lunch (registration here). Now we offer a guest commentary about the California fires. We thank our good friend and GIC board colleague Philippa Dunne for sharing her essay with our readers. Philippa is coeditor of three macroeconomic newsletters – The Liscio Report, which has a trading focus, Sightlines Bulletin, which offers “concise data-driven monthly analyses of the direction of the American economy,” for professionals and academics, and TLR Wire, frequent, short notes and graphs on important aspects of fresh data missed by the mainstream intended for all readers You can learn more about both and subscribe at http://www.tlranalytics.com. Two differences jump out when we attend conferences with a higher percentage of speakers who were not born in the US, but may teach here, and we share these now as observations, not criticism. There is considerably more concern voiced about the effects of market concentration and pricing power, which we have outlined; and there is a general sense that US citizens, perhaps especially those in the financial markets, are not accurately anticipating the market impacts when, say, lawsuits and insurance claims caused by extreme weather start rolling in at an ever faster pace. I grew up in Malibu, where fires were a central part of my childhood. Every fire has its own unforgettable personality. One marches as a belligerent wall, missing little in its path to the shore; one changes its mind at the last minute, trapping the fire crews and their equipment on the wrong side of the column; and some, like the recent Woolsey fire, flame seemingly in all directions, pouncing on areas the size of football fields in a second. And they all have different ways of introducing themselves. Sometimes a bunch of tumbleweeds thud into the house: the Santa Ana wind. Sometimes sirens race up the highway; by the time I was five, I could tell which canyon they turned into; and sometimes I would first see reflected flames flickering in my window. Then it’s grab all the animals and your toothbrush, unlock all the doors and gates for the firemen, kiss the ground by your bedroom door with hope, and head for the Georgian Hotel in town. From our rooms there we would stay up all night, looking out across the bay as the unspeakably beautiful flames winged up and down the mountains, seemingly in silence although we knew they were panting. Firefighting is a male-dominated field. The first female firefighter in this country was Molly Williams, Volunteer #11, a slave owned by a New York City merchant. There have been all-female forest crews since the 1920s, but in the US only 2% of firefighters are women. Los Angeles Mayor Eric Garcetti promised that by 2020, 5% of the LAFD will be women; currently that’s 3.5%. I’m not being sexist when I refer to my wonderful childhood heroes as men. An owl lands on the beach; a coyote limps on singed foot pads, showing no interest in a fleeing rabbit. A firefighter staggers in the wind. The fires have always been unpredictable and terrifying, but they have moved into a new dimension. The Paradise fire has set records, but the recent Woolsey fire that flew to the beach in west Malibu, bad as it was, isn’t up to today’s standards. In 1970, the Santa Ana, blowing at 80 miles an hour and gusting to twice that, drove a 30-mile wall of fire from Newhall to Malibu. First we heard it mentioned on the news, and then it was barreling over the mountain so quickly that we barely had time to load up the animals. It did take out the Spahn Ranch, where Charlie Manson and his crew lived (no comment), but also the iconic Serra Retreat, a real loss. That fire was a record-setter then, but it isn’t even in the top twenty these days. I recently visited friends in Santa Barbara and finally saw firsthand the incomprehensible destruction in the path of the fire and floods of last year. One friend, a real estate agent in Montecito, one of the most idyllic places on earth, said that he is having a tough time determining if business is slow because of interest rates or because buyers are afraid to invest in multi-million-dollar properties threatened by fires and rushing mud. We drove through the slide area: Geologists are still calculating how much the mud (A Look Inside the Montecito Disaster Probe), the consistency of honey and traveling at up to 27 miles an hour, was needed to launch “giant boulders” down the washes. Thank you, always, to the fire crews, both the pros and the inmate volunteers making $2 a day (and $1 an hour when they are fighting active fires) – may many more go on to join Cal Fire; to the California Highway Patrol – you haven’t lived until a CHP yells at you to “gun it” in order to get over a smoldering divider; and to the migrant farmers who kept working in the fields through the smoke. My job during the fires was always to drag panicked horses out of their stalls and onto the beach. They really do run back into burning barns. To give you an idea what it’s like, during the Newhall-Malibu fire I was pulling a mare across the sand when I noticed I was stumbling inexplicably, or so I thought. I looked down at my foot, now in slow motion, which was sitting on a board. I picked up my foot and the board came with it, held by a large nail that I couldn’t feel. A stranger ran over, said “It’s okay to scream,” pulled the board off, and raced me across the sand to the vet’s office. I got a tetanus shot and no other treatment. There was no time for that. And mine was just an ordinary fire experience. No horses were lost in that canyon, but we feel a bit like those horses right now. We’re not a political newsletter, and this is one of the most divisive topics in our country right now. Voicing these opinions could lose subscribers, but we are willing to take that risk. We all have different opinions and want to hear yours. The optimistic approach is the one that takes steps to slow the climate changes that produce increasingly heavy weather and the historic droughts that make devastating fires more likely. Stephen Pekar, who runs the paleoclimate research lab at the City University of New York, among his many other activities, notes that climate changes are now taking place between 100 and 1000 times faster than they have in the past. To get to the point of taking steps to curb climate change, we have to change the conversation. The risk is asymmetrical – didn’t that Schopenhauer guy have something to say about that? While it’s true that there have always been dramatic shifts in climate, the drivers of those shifts can be measured, and they do not fully account for what we are seeing. We all need to know what the cores drawn from the Greenland ice sheet are telling us. That key research is beautifully chronicled in Richard Alley’s Two-Mile Time Machine (https://www.amazon.com/Two-Mile-Time-Machine-Abrupt-Climate/dp/0691102961). Otherwise we have only opinions. There are tremendous opportunities in the renewable energy sector, jobs that would help balance the increasingly unequal opportunities available to our working classes. For renewable sources to really take off, we’d have to drop subsidies for the fossil-fuel producers and let the markets work. When the mechanization of our farms sent farm work tumbling from something like 30% of the workforce to the current 1–3%, depending on how you jigger the numbers, the transition was largely enabled by the war effort. Workers were moved from the farms into the factories, and much of what they made was battle-related. Had they been left in the rural areas to fend for themselves, as so many of our machinists have been, what would have happened? Of course, we’d advocate for a green-energy rebuild and retrofitting, not more weaponry, and the tools are ready at hand. Frank Nutter, head of the Reinsurance Association of America, told writer Eugene Linden a quarter of a century ago that “global warming could bankrupt the [reinsurance] industry.” Linden also points out that while the Insurance Information Institute was singling out Florida as having the greatest exposure to the combined effects of a changing climate, Governor Rick Scott and Senator Marco Rubio went on record to dismiss the threat. Cue in the creative destruction of a true market economy. Here is the link to the latest US government report on climate change. We recommend perusal with and open mind and a willingness to alter views: Fourth National Climate Assessment, Volume II: Impacts, Risks, and Adaptation in the United States, https://nca2018.globalchange.gov. For more information on how to join us in this important conversation at the January 25th GIC-USFSM conference, please visit www.usfsm.edu/climate. The January 25th GIC-USFSM conference, Adapting to a Changing Climate: Challenges & Opportunities, to be held at the University of South Florida Sarasota-Manatee, is open to the public. The sponsors, including Cumberland, helped so as to allow the cost of registration to be held to $50, a registration fee that covers the lunch. Climate-change believers and deniers are welcome. The purpose of the event is to put facts and details in the public domain for discussion. Red tide and the toxins it carries are among the issues we will take up. Ask any Sarasota restauranteur or hotel manager what has happened to business these last few months, and the economic impact on Florida becomes clear. All political personalities interested in mitigating the effects of red tide on their jurisdictions are welcome to attend or send staff. Let me get to a specific health issue related to red tide. I will start with a quoted email from a national personality whom I know personally. He contracted an illness believed to be a result of breathing red tide toxin or the related algae bloom toxin. “I’ve easily found articles with various analyses of probable causality between bodily responses to Brevetoxins and auto-immune system responses generally associated with organizing pneumonia. “The experts I have want to identify similar episodic correlations in order to study specific trends and narrow the range of potential causality. “Has your group associated among any Florida pulmonologists that have seen similar cases? “One of the fundamental issues may be that the primary group at risk of serious chronic illness is visitors that have no prior immunities from low doses of Brevetoxin exposure. They suffer the effects of a red tide bloom of Karenia brevis algae and then leave Florida before any of the major chronic illness symptoms appear. “They know they are sick but have no contact with medical professionals that understand normal red tide irritations. That now seems to be the primary missing link. “Initial biopsy result on the biggest spot in my lung found ‘organizing pneumonia’ and no malignancy – good news. “The point at which the coughing and respiratory irritation that resulted in this particular ‘pneumonia’ began, however, directly coincides with my exposure to red tide in April. My med records are very clear that there was no cough or other irritation symptoms before that exposure. “If there would be any interest in this situation among you and your friends, let’s talk. “I’m going to enjoy Thanksgiving with family and head to FL. If there’s interest, maybe we can gather and discuss a follow-up for the public health of FL, as Judy and I traverse the Tampa area after Thanksgiving. Dear reader: My point of this personal story is direct. This could be you or me. Research and discussion are needed. And what we’re dealing with here is a second-order effect of climate change, just like growing hurricane intensity and rising sea levels. We are going to have a full auditorium on January 25, with thorough presentations and discussions of facts. “K. brevis produces powerful toxins called brevetoxins, which have killed millions of fish and other marine organisms. Red tides have damaged the fishing industry, shoreline quality, and local economies in states such as Texas and Florida. Because K. brevis blooms move based on winds and tides, pinpointing a red tide at any given moment is difficult. “In addition to killing fish, brevetoxins can become concentrated in the tissues of shellfish that feed on K. brevis. People who eat these shellfish may suffer from neurotoxic shellfish poisoning, a food poisoning that can cause severe gastrointestinal and neurologic symptoms, such as tingling fingers or toes. Here is the link to the latest US government report on climate change. We recommend perusal with an open mind and a willingness to alter views: Fourth National Climate Assessment, Volume II: Impacts, Risks, and Adaptation in the United States, https://nca2018.globalchange.gov/. Dr. Michael D. McNiven, Managing Director and Portfolio Manager at Cumberland Advisors, joins Dr. James Curran, Dean of College of Business at USF Sarasota-Manatee, to discuss their upcoming event, Financial Literacy Day. John Mousseau & Matt McAleer are featured on Suncoast Speaks to talk about about Financial Literacy Day. Chuck Englund dives into financial literacy and what attendees can expect to hear and learn at Financial Literacy Day. USF Sarasota-Manatee, Cumberland Advisors and the Global Interdependence Center partner to host the annual events titled, Financial Literacy Day, each year. This interview was in anticipation of the 2018 event. Join us on Thursday, April 11, 2019, for the Third Annual Financial Literacy Day: An Update on the Financial Markets and Economy. This program features keynote addresses from Gretchen Morgenson, Senior Special Writer in the Investigations unit at The Wall Street Journal and Susan Harper, Canadian Consul General in Miami and Former Economic Minister for Embassy of Canada. Click here to register through USFSM. David Kotok was featured in advance of the 2018 event on the Suncoast View television program and you can watch and read about it here. Banks and the banking system are a big part of the April 5 Financial Literacy Day to be held in Sarasota at the Selby Auditorium on the University of South Florida Sarasota-Manatee (USFSM) campus. We are going to hear from Federal Reserve President Raphael Bostic, whose Atlanta-headquartered district includes the State of Florida. So by definition the Federal Reserve Bank of Atlanta is the central banking authority of every bank in the greater Sarasota-Bradenton region. Major changes in bank supervision and regulation are underway; and new legislation is changing the playing field because requirements differ for the community banks, the small and mid-sized banks, and the very large banks. Hundreds of thousands of individuals, businesses, and other organizations in the greater Sarasota-Bradenton region interact with banks daily. Attendees will also hear from Chris Whalen, who will offer his views on the banking system. Chris has a distinguished career in credit ratings and in bank analysis. His newsletter, the Institutional Risk Analyst, is famous; and his bank-rating mechanism has been well-known to investment professionals for decades. He frequently appears on Bloomberg TV and CNBC. On the municipal bond panel there will be room for discussion about the forthcoming changes that allow banks to count their holdings of munis as high-quality liquid assets in determining their capital requirements. Many see this change as bullish for Munis and for the investing public. Attendees at the April 5 event will be able to question experts on the rule changes and what those changes may mean for an investor or a broker-dealer who sells munis. Disclosures are also forthcoming about broker markups, and they, too, will have an impact. The sessions are designed to give the public a real window of opportunity to learn about these issues and to pose their questions to experts. The Financial Literacy Day stock market sessions will also include discussion of banks, bank stocks, and related securities. Banks and financials make up about 15% of the American stock market weight, looming large in the US investing landscape, and they have been strong performers in the recent stock market rally. Will that trend continue? Why or why not? Are there credit issues on the horizon? What will the implications be for banks as the Federal Reserve changes its monetary policies? When it comes to banks, there is plenty to talk about on April 5th. Registration is now open for the April 5 all-day event. Financial Literacy Day is an open forum: Individual investors, state and local officials, financial institutions, pension trustees, philanthropy activists, policy makers and policy wonks – all are welcome. At Cumberland we believe everyone benefits from increased financial education. The cost is only $50 to register ($25 for students), and that is just to help cover GIC’s and USFSM’s expenses. Cumberland is sponsoring the event and hosting lunch and the closing reception. Attendees are welcome for the whole day or part of the day. Please reserve your spot soon – we expect to have a full auditorium. The event is open to public participation. All are invited and welcome. You can make your reservation online and learn more at https://www.interdependence.org/events/second-annual-financial-literacy-day-update-financial-markets-economy/. The stock market will be a prominent topic at the April 5 Financial Literacy Day in Selby Auditorium on the USFSM Sarasota campus. In the first stock market session, nationally known technical analyst Katie Stockton will pair with Cumberland’s quantitative mathematician, Professor Leo Chen, in a broad discussion of techniques used in stock market management. Alison Gardner of RBC Wealth Management will moderate that session. The second stock market session is a powerhouse that includes Jeff Saut, chief investment strategist of Raymond James; Jeremy Schwartz, director of research at WisdomTree; Adam Johnson, formerly an anchor at Bloomberg TV and now the author of Bullseye Brief; and Cumberland’s director of ETF strategies, Matt McAleer. This top-flight panel will be moderated by Bill Kennedy, chief investment officer at Fieldpoint Private. Anyone interested in the stock market is in for an exceptional day. This April 5 event is an open forum: Individual investors, state and local officials, financial institutions, pension trustees, philanthropy activists, and policy makers are all welcome. At Cumberland we believe everyone benefits from increased financial education. A full program will be offered on April 5. In addition to the keynote speech by Atlanta Fed President Raphael Bostic, featured speaker Chris Whalen, Chairman of Whalen Global Advisors LLC and Global Independence Center (GIC) board member, will discuss the US banking system. Panel discussions will cover not only munis but also the outlook for the US and world stock markets, the global economic outlook, and the use of quantitative measurement and technical analysis in the stock market. The cost is only $50 to register ($25 students), and that is just to help cover GIC’s and the University of South Florida Sarasota-Manatee’s expenses. Cumberland is sponsoring the event and hosting lunch and the closing reception. Attendees are welcome for the whole day or part of the day. Please reserve your spot soon – we expect to have a full auditorium. The event is open to public participation. All are invited and welcome. You can make your reservation online and learn more at GIC’s website https://www.interdependence.org/events/browse/programs/second-annual-financial-literacy-day-update-financial-markets-economy/.